Heritage and Festivals in Europe critically investigates the purpose, reach and effects of heritage festivals. Providing a comprehensive and detailed analysis of comparatively selected aspects of intangible cultural heritage, the volume demonstrates how such heritage is mobilised within events that have specific agency, particularly in the production and consumption of intrinsic and instrumental benefits for tourists, local communities and performers. Bringing together experts from a wide range of disciplines, the volume presents case studies from across Europe that consider many different varieties of heritage festivals. Focusing primarily on the popular and institutional practices of heritage making, the book addresses the gap between discourses of heritage at an official level and cultural practice at the local and regional level. Contributors to the volume also study the different factors influencing the sustainable development of tradition as part of intangible cultural heritage at the micro- and meso-levels, and examine underlying structures that are common across different countries. 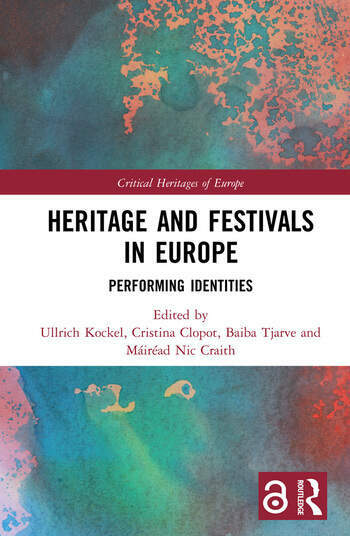 Heritage and Festivals in Europe takes a multidisciplinary approach and as such, should be of interest to scholars and students in the fields of heritage studies, tourism, performing arts, cultural studies and identity studies. Policymakers and practitioners throughout Europe should also find much to interest them within the pages of this volume. Ullrich Kockel is Professor of Culture and Economy at Heriot-Watt University in the UK. Cristina Clopot is a Research Associate at the Intercultural Research Centre, Heriot Watt University in the UK. Baiba Tjarve is a Researcher and Project Manager in the Research Centre at the Latvian Academy of Culture. Máiréad Nic Craith is Professor of Culture and Heritage and Director of Research at the School of Social Sciences at Heriot-Watt University in the UK.